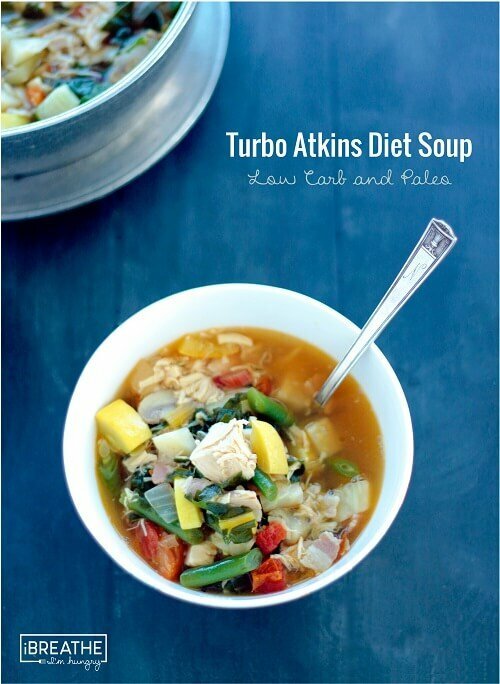 This past summer, Woman’s World Magazine reached out and asked me to create a low carb soup recipe using chicken and lots of healthy low carb veggies for the Turbo Atkins Diet Soup feature they were running in the November 9th issue. Of course I wanted this low carb soup recipe to be delicious, but I also wanted it to be undeniably healthy – since so many critics are still under the misconception that a low carb diet is all bacon, steak and cheese, with little to no vegetables. That’s just not true – or at least it doesn’t have to be if you are mindful about where your carbs are coming from. 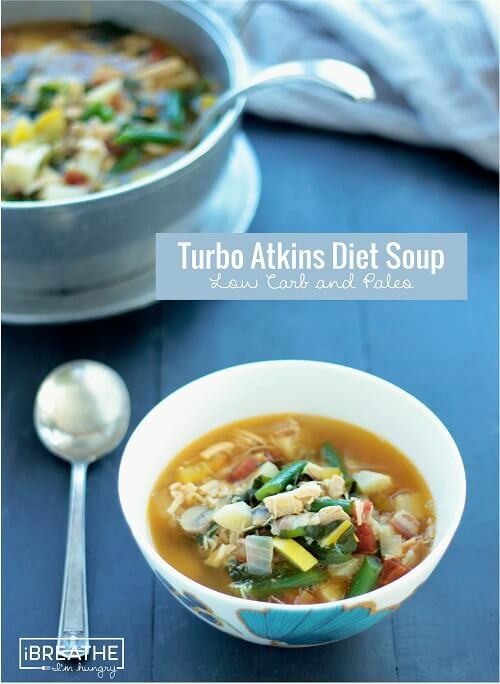 This Turbo Atkins Diet Soup recipe is loaded with delicious veggies that are low in carbs, filling, and tremendously good for you – making it the perfect complement to any low carb plan. Now let’s talk about some of these ingredients – because every single one of them was chosen for a purpose! I went with chicken as my protein because it’s widely available and has a mild flavor that pairs well with all of these veggies. Of course I added bacon, because it adds a lovely smoky flavor and a hint of decadence – it also provides some of the metabolism boosting fat in this recipe. 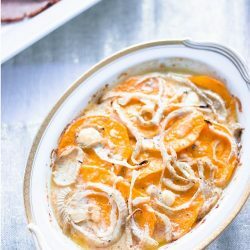 Celery root (Celeriac) is the perfect alternative to potatoes in low carb soup recipes (like this one) because it’s super filling and loaded with fiber, antioxidants, and a hefty dose of phosphorus, Vitamin K, and Vitamin C. If you can’t find celery root you can use cauliflower, jicama, or even turnips as a replacement – DON’T SUB PARSNIPS AS THEY ARE TOO HIGH IN CARBS. The yellow squash adds color and texture, but it’s also high in potassium (especially important on a low carb diet) and Vitamin A. You can substitute any greens in the soup (EXCEPT KALE WHICH IS HIGH IN CARBS,) but I went with swiss chard in my keto chicken soup recipe because it holds up better in liquids than spinach, which tends to turn the broth muddy. I also love the texture and color of the swiss chard stalks, and the fact that it’s low in calories and carbs but incredibly nutrient dense. Garlic, onion, sundried tomatoes not only add flavor but are also powerful antioxidants and contain immune boosting compounds just in time for cold and flu season! The green beans I added for color, texture, and low carb/calorie filler (not that they don’t also provide valuable nutrients), and the red wine vinegar added at the end of cooking balances out the flavor of the soup and gives it a mouth-watering quality that keeps you coming back for more. 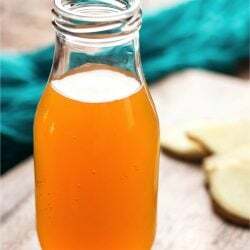 You can also substitute apple cider vinegar if you prefer. You’ll be amazed at the difference it makes – just be sure to add it at the end so you don’t lose the slight tang during the cooking process. Finally, the fresh basil over the top gives it a punch of brightness and unites all of the other flavors, making every bite pure bliss. All of those healthy and delicious ingredients combine beautifully to make this incredible keto chicken soup – which comes in at just 136 calories and 4g net carbs! I think the flavors in this low carb chicken soup get even better with time – and the people who tested it for the Woman’s World article agreed! Replacing just one meal per day with a bowl of this hearty low carb soup will not only load you up with healthy vitamins and minerals, it is also a powerful weight loss tool because it is so filling and has so little calories! Have it for lunch AND dinner and you could lose up to 10 pounds in one week, as did some of the test subjects for the magazine article! If you give it a try be sure to let us all know how you do! As per the comments and Facebook Group, quite a few are subbing in parsnips and kale, but as you can see by this list those are the highest possible carb options and can absolutely affect your weightloss on this plan! There is room for subs, but be smart about it per this list! 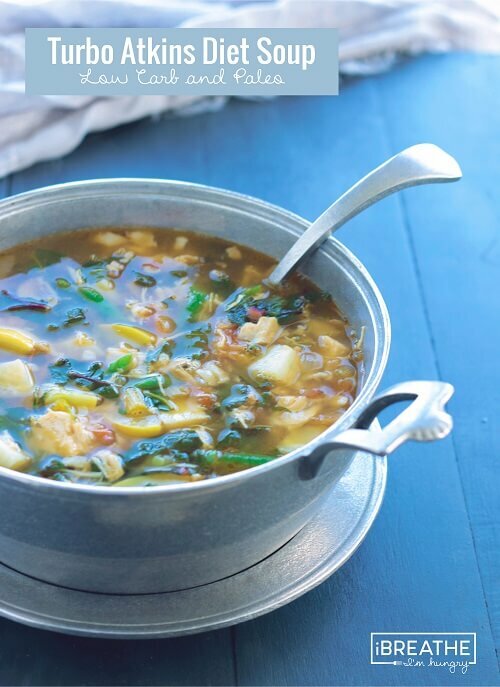 This delicious low carb soup recipe is loaded with healthy veggies and chicken. It’s so good it was featured in Woman’s World Magazine in November 2015! In a large soup pot, cook the bacon and olive oil over medium heat for 2 minutes. Add the onions, garlic, sundried tomatoes, and mushrooms. Cook for 5 minutes. Pour in the chicken stock and water, then add the celery root and chicken. Simmer for 15 minutes. Add the squash, green beans, and swiss chard and simmer for 10 minutes. Add the red wine vinegar and season with salt and pepper to taste. Stir in the fresh basil just before serving. I’m super keen to try out this soup, however some of the veg might be a bit difficult to find where I stay. As you mentioned, I’ll most likely sub the celery root with Cauliflower but my question is what could be subbed for the yellow squash? Is that the same as a patty-pan? I’ve only ever seen those where I live. or zuchini, which is apparently the same family? pattypan or zucchini are fine. Hello, I am fructose intolerant. I really want to try this soup, but I am not to have tomatoes, garlic, onions, or green beans. Would the soup work the same as far as weight loss if I just omit these vegetables? Hi! I don’t really want to follow the rest of the meal plan (because I’m lazy and do not like to do a lot of meal prep). Since the protein macros in the soup are high, can I just add butter to increase the fat? I pretty much only want to eat just the soup. Thanks! Yes you can absolutely add more butter and or bacon to increase the fat in the soup! OMG! This is the soup I’ve been looking for! I’ll have to make 2 batches (1 with and 1 without due to mushroom allergy) for my family. Going to try it with pressure cooker which I use all the time! Thanks! Can this be made in the crockpot? If so, how long? I do not eat meat so subbing an extra egg in the morning. Also subbing fish and/or shrimp in the soup. Assuming it will be ok since it’s just a protein switch. Please forgive me if someone has asked this before but can I make this in my crockpot? This looks really good and please forgive me if it gas beeb asked before, but do you have this converted to metric so not only the americans can enjoy this? Cups, tbsp ect are very imprecise measures when we have no idea if the ingrefuents we have available are the same. I.e 4 slices of bacon…. in a bacon nation (im Danish – its our absolute no. expot goods) 4 slices of bacon is no less than 100g We cut it of a big piece our selves. But how much is it in your recipies! INSTANT POT: I’m obsessed with my instant pot and made this recipe today in the instant pot and it turned out great. I sauteed called for ingredients per the directions then added the stock, water, mushrooms, tomatoes, jicama (they didn’t have celery root) and chicken. I set it on high pressure for five minutes, did a quick release, then added the rest (except basil and vinegar per directions) and reset it for three more minutes on high then did a quick release and added salted, basil, red wine vinegar, stirred, and ate. The veggies were toothsome – not too mushy, which is perfect for me. If you like it mushier, I’d say add time to the first cycle. Great recipe! Loved it! I still am going to try to find celery root, but I was amazed at how much the texture of the jicama (which is REALLY great raw, too) mimicked potato. Thanks for sharing your IP instructions!!! Thanks for sharing the instant pot version, I was just going to ask! I really like this soup. It introduced me to swiss chard and celery root as well. I confess that I did add three big spoonfuls of marscapone cheese to the soup at the end, to make it a touch creamier, so clearly I was not following this 7-day soup diet to a T, yet I still lost 5 pounds. I bought the ingredients for the full recipe, but I made only half each time. I love how the celery root is somewhat like potato, at least in this soup. One of the things I do miss by eating low carb is potatoes, and this soup gave me the illusion of having guilt-free chunks of “potato” in every bite. I’m continuing to eat this soup into a second week, just because I enjoy it so much, not to mention that it’s cold(!) outside. I work three days a week and help care for a younger sibling, so having leftover soup ready to go at mealtime is a big plus. Now I’m going to explore some of the recipes on your Squeaky Clean Keto plan. Thank you for this site and your great recipes. I’ve tried many over the past year and every single one has been good, with many going into regular rotation in my house. Hello- What can I substitute for the yellow squash? I can’t eat it. What happens if you can not eat the whole 2 cups, I can only eat maybe a cup maybe a cup and a half. Just as long I stick with the breakfast and the soup should I be fine? Can celery be subbed for celery root? I don’t recommend it, the celery flavor would be overwhelming I think. Love this soup! It’s very delicious! We made it with a combination of celery root and radishes, for one of the veggie choices, and swiss chard for another of the selections. We had bone broth from cooking up two small (organic) chickens and also a turkey leg. We used all the meat (we made a double batch of the soup), so our soup is made with a combination of white and dark meat. The broth from pressure cooking the chicken and turkey was not enough, so we supplemented with our own bone broth (which we make every week, recently including the gelatine from our recent pig’s head, ears and trotter (cooked to make Head Cheese) into our regular bone broth, making it extra gel and nutritious!). The resulting broth in the soup is so delicious and our soup is quite gel until heated. Next time we will use 100% broth, no addition of water. We will definitely make this soup again. It’s a bit of work, lots of prep, but then lots of meals afterwards. You feel really healthy eating this; especially when made with homemade broth. Vitamin D enhanced mushrooms are just mushrooms exposed to natural sun light. They will make the vitamin D.
I have made this soup many times and it is amazing. I absolutely love it. Make this….you won’t regret it! One quick question…. is the 1 Tabkespoon butter for breakfast the one for Bullettproof coffee or is it to cook the eggs?? If it’s eggs than actually 2 T. for breakfast correct? Your recipes are making this Keto way of life pretty tasty! Thanks for your hard work!! Can you make this pescatarian or vegetarian? When I enter the recipe into carb manager, it shows it is 11 carbs per serving but the website shows 4. Does everyone log their food while doing the 5 day soup diet? Are you looking at total carbs or NET carbs? Is your version of Keto grain free? All versions of Keto are grain free. I’m starting this 5 day soup challenge tomorrow … making the soup now and it smells AMAZING !! Can I use sundried tomatoes that come in jars? It looks like they’re probably packed in oil. I have been thinking of starting the keto diet and was on the verge of starting it when I came across your recipe and website. I just have one question. Do I need to be in the ketosis stage before starting this soup diet plan? If yes, then I will start with your 3-day keto kickstart plan. Kindly let me know. Loving your blog and recipes. You don’t have to be in ketosis to start but it will be a more intense detox to be giving up carbs as well as sweeteners, gluten and dairy all at once. True. I was off Keto for about 2yrs and went right back into Ketosis at the end of the 5 days. i’ve been on keto for almost two month, now that i’m on my 4th day on this Atkins diet soup i have not lost much if so maybe half a pound. help ? My two year old – who has started refusing all veggies – loved this! My husband said it’s the best soup I’ve ever made, even better than my gumbo! I used turnips and collard greens, since the stor was out of swiss chard and celery root. This truly is one of the best, most savory and satisfying soups I’ve ever made or eaten! Thank you for the work you put into this blog and your recipes. You are a lifesaver! Thank for this recipe. I love this soup. It is my ‘go to’ every time my husband goes away for a few days. I can’t ever find yellow squash but found out that yellow courgette has the same nutritional value. I am currently freezing batches of the vegetables that will not be available in the winter. Living in rural France is lovely but you can only get things in season. I saw a post on here saying that a rotary chicken gave four cups of meat. That was really useful advice. I now buy a roast chicken, take off the skin and debone it etc. I use all those bits to make my stock along with the veg peel and some herbs/spices. A couple of weeks ago I bought a smoked chicken from Lidl – gives a different sort of flavour, still very yummy. Sometimes I use a stick blender for a few seconds to make a thicker soup while still having chunks. It is so easy to have batches of this soup in the freezer and then I don’t have to cook, just warm up the soup and eat it. Very filling and very delicious. This soup is awesome. I made it yesterday and had it for lunch today. The broth is so full-bodied and luscious! A real comfort food that is good for you. I followed the recipe to the “T”, using Collard Greens instead of Swiss Chard because I couldn’t find the Chard at my store. Totally surprised that this tastes so great and it all comes from healthy ingredients. I was able to freeze individual servings for future lunches…this is a great addition to my food choices! Yay!!! Thank you so much! Holy cats. This soup is simply fantastic! The red wine vinegar and sun dried tomatoes are such a small portion of the overall recipe, and I don’t really detect their individual flavors in the soup, but I think they are the key to the soup’s balanced, bright flavor. I made my batch yesterday and measured it out for the 10 meals for the week. As a variety-oriented person, I was a little nervous about committing myself to a week of the same meal, but I am excited to change it up for some of the servings and try some of the ideas people have posted here. I will try blending it to create more of a cream soup, and for some servings I will sub other herbs for the basil (I think thyme would be lovely in this). A little sriracha or curry, or a tiny dash of balsamic are interesting options as well. Again, I think the recipe is perfect as is, but I know myself well enough to plan ahead for my own need to change it up on occasion. I was surprised at the amount of carbs in sun dried tomatoes (no oil version included) per tbsp-!?! and this calls for 1/4 cup.. I omitted it.. Thank you for this comment Ellen. I was worrying about the same thing. Good ideas! I can’t wait to try this recipe!! I wanted to first thank you for this wonderful, meticulous, and well thought out plan (the 5 day plan)! My question is this: the nutrition facts are for a 1.5 cup serving. But your plan asks for a 2 cup serving twice a day. I’m using a macro tracker and would love to put them into it. Is there a reason for the difference? Should I just use math to increase the macros equally by 25% for the 2 cup serving (I’m during the 5-day plan). I just did the math, or “a math” and got the following for 2 cups: Calories 181.2; Fat 5.2; Carb 5.2; Protein 25.2. I subbed cauliflower and collards, so I wouldn’t know the exact counts for me. I figure (hope) this is close enough. I divided and multiplied on paper, so others may want to check my math. I’m at the end of my second day of the 5 day soup diet. I’m having problems eating the snacks, the egg and the tuna snack. I haven’t been eating the snacks at all because I don’t feel hungry. Will it have an impact on my weight loss? Eating such a filling breakfast, it keeps me going until lunch time, then it’s soup again for dinner. I must add the soup is delicious, so are all your recipes. Thank you so much, you’re a genius! I wasn’t eating breakfast, I did the intermittent fasting, so this is why I’m so satisfied after eating breakfast on this 5 day soup diet. Will report back to you after my 5 day soup diet, hopefully with some kilos lost. Melissa, my 5 day soup diet went well, I lost 5lbs and feel great. I’m going to make the soup again so I can have it on hand for lunch or dinner. Is there a nutritional breakdown, carbs, calories, protein, fats? I could have missed it…. It is amazing! I followed the recipe exactly! I am so happy to have this soup. Thank you so much. I will make this soup often just to have in the refrigerator when I am not hungry, due to the heat and being in ketosis. I’ve been drinking oceans of water to curb the appetite with little help. I AM STARVING! I wasn’t going to weigh in until the end, but noticed I’m bloated , bigger belly and my pants felt tight in the waistline…I gained 3 pounds! Only changes I made to the recipe were that I made my own broth with a bunch of chicken/duck bones I had saved up, I grilled most of the veggies, just a lite coating of olive oil, added a little shrimp because I didn’t have enough chicken, then separated the broth from the veggie/chicken stuff so I could portion it out correctly and get it down…I’m not a soup fan. Just spiced it up with cayenne and curry so I it wouldn’t be so bland and I could try not to dump a truckload of cheese on it. After the weigh in this morning with the 3 pound weight gain, I had uhh…nasty bowel issues, so lost 2 pounds there, but just gained another pound re-hydrating. I might also mention that I work out fairly hard for 1.5 hours a day (my workouts have sucked since starting this), walk the dog briskly for at least an hour a day, my head is killing me and I am misserable!!! I actually wasn’t trying this to lose weight as I am 5’4″/ 115/ 52 YO, muscular build, just clean up my diet and get rid of the belly bloat What’s going on here? Can anybody help?? You gave a recipe you didn’t even follow 3 stars – your changes sound like they would taste awful but that’s not the fault of my recipe. AND if you’re working out that hard you shouldn’t need me to tell you that you’re probably not getting enough calories on this plan so no wonder you are starving and not losing. There could be any number of reasons for the bloating, were you already keto before? if not you’re detoxing from carbs, gluten, dairy, sweeteners, and your body will rebel against all of that. If you were keto already then you could still be adjusting to a lack of dairy or bloating from getting more veggies and fiber into your diet than usual. Other than that I can’t comment on what your issues are because you aren’t actually following my plan as written. Thanks, Mellissa! It’s not the recipe I rated 3 stars (it was very good! ), it was the weight gain issue. I believe you are right about the detoxing, casing the bloat, etc. After the 5 days, I switched to nothing but meat and eggs and things are looking better. The star rating is for google to determine the quality of the recipe and whether or not to show it to more people in searches. You had issues with the plan personally but that shouldn’t affect how the recipe is seen by google or others who might want to try it for themselves. Happy for you that less vegetables in your diet is improving your digestion. Sorry about that…5 stars here, it really is good! Do you know if/how I can change the rating on the original post? Hi Ms Melissa, what can I substitute for bacon, without altering the macros. Please let me know. Thank you. I added some turkey kielbasa sauteed in butter. It’s was awesome! Sounds like Keto flu. You may need to add back carbs to relieve this symptom. As light as you are weight wise, it might benefit you to use a carb calculator to determine how many carbs you need to “maintain” your weight, rather than lose it. I made this soup the other night. Before Keto there would have been no way I would of even tried it. Squash & mushrooms are not something I like to eat. I had never tried jicama or collards (I had to use the substitution for the recipe). This soup is AWESOME!!! I couldn’t finish a full serving. The jicama – if I didn’t know better I would have thought it was potatoes!!! Thank you so much for sharing this!! Produce section. It’s a large root vegetable. Looks like a giant round turnip. HEB, Kroger, and WalMart all carry it in Texas. I love this soup! It makes me stay on track or get back on track with this way of eating…. plus it is delicious and full of flavor. Perhaps a super dumb question I didn’t see here….fry the bacon in oil in the pot…do i keep all the bacon grease in there as I’m adding the other ingredients, or do i drain it first? yes keep it in there! For me the hardest part about eating healthy is I am allergic to a lot of vegetables. I really want to try the soup and I am curious what you would recommend swapping for Squash and Green beans? My stupid allergies ruin all my fun! I’m thinking about doing the diet to turbo charge my starting weight loss, but I can’t do bacon & eggs every morning. I don’t really like bacon and eggs I can only do every other day. Do you have suggestions for the breakfast that would work with the diet? I am getting ready to make the soup. My question is, for 5 days, do you eat the soup for breakfast, lunch, and dinner? Any snacks? Read the entire blog/directions….. it is clealry stated what to have for breakfast, lunch, snack and dinner. This is awesome Janis, thanks for sharing your vegetarian version!!! I’m a pescetarian here so I’m glad to hear you liked your vegetarian version. Did you use anything to sub for the bacon or is it still delicious without? 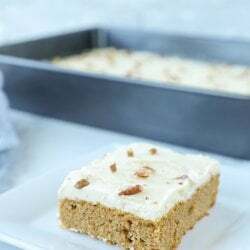 Dear Mellissa – another fantastic recipe – thank you so much for all you do for us! To my fellow “Breathers”: I just made this soup last night and had my first bowl today. Like everything else I’ve made from Mellissa, it was delicious! I followed the recipe exactly, but may try some subs in the future – a beefy take, maybe radishes…(definitely making it again). One interesting tidbit, the Swiss Chard my grocer had was the red variety. That, and maybe the sun dried tomatoes and red wine vinegar turned the soup a a lovely rosy pink color. Tasted fantastic but it’s the first pink soup I’ve ever had. Haha – “breathers” LOVE IT! After 5 days I have lost 7 lb, also I uncovered a possible food allergy. With no dairy, nuts or sweeteners for 5 days a persistent little rash I had on my wrist and the top of my foot is gone. Now it will be easy to pinpoint as I add back those foods (If I ever stop this amazing plan – I’ve already made another batch of soup – it’s sooooo good!) People at my work smell it and they come running like my cats when they hear the can opener lol. I’m taking a crock pot full for a potluck next week. My deviations to the pan was one day I only had soup once (forgot to take it to work), and I do not like BP coffee, so I added a Tb of butter to each serving of soup. Also Mellissa – I cannot say enough about what a wonderful human being you are. I read every comment on the 5-day plan, and some of the people were not very nice. Every question had already been answered in the instructions, yet people hammered you like you were their personal assistant. You kept your cool, and even the one time you responded with justifiable indignation, you were a class act. Dairy was the culprit! A little is OK so don’t panic, I can still have cream in my coffee – whew! Thanks so much Shari Ann and congrats on figure out what was stalling you! I went shopping today to buy whatever ingredients I did not have on hand for this recipe. I even told a fried about it and she went shopping for the ingredients too. tomorrow, we will connect by phone, and prepare your 5 day low carb detox soup together, as we chit-chat. None of my local grocery stores offer celery root, so, swiss chard, baby spinach, some celery sticks and green zucchini will find it’s way into my soup. I a wondering, however, if you think a small amount of grated fresh ginger would be a good fit for this soup? Thank you! 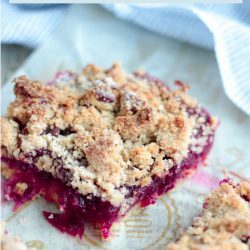 I appreciate you sharing this recipe and trying to keep up with answering the posts in here. Hi Patrice, I’m not sure what the ginger will do to the flavor profile of the soup, especially with celery instead of celery root in it – it could be too astringent. I would suggest grating a little into your first bowl and seeing how that tastes before you put it into the entire pot! Hope you ladies do well, keep us posted! Could I just use celery in stead of celery root that I cannot find here. That will alter the flavor and texture quite a bit, as well as the soup volume – I recommend subbing cauliflower or rutabaga if you can’t find the celery root. Has anyone tried making this delicious soup in slow cooker? I make my own butter, churning it from heavy cream I get from a local creamery. I am trying to jump start some weight loss as I have been too lax in the past few weeks and gained back 7 lbs. I am making the soup right now and my breakfast. I want to do it right, and would just like to understand better what the difference is between butter and heavy cream. Thanks! actually, I think I just answered my own question in that of course the buttermilk that comes out has carbs in it. So this is why the butter is better for this fast. Sorry about that! I can’t believe I just spent the morning pondering this. For someone who does not eat bacon, can anyone recommend a substitute to get the smoky flavor? Maybe a drop or two of liquid smoke? Or just skip it and the soup is still delicious? liquid smoke would work well actually just don’t overdo it! Day 2 and before lunch (11:30am) I was starving today. I had the breakfast, lunch and snack so far today and I feel like I’m starving, plus I feel so sleepy as I type. Any suggestions? Wrong spot BUT how can you recommend celery root over kale when the carb count of celery root is so much higher than kale??? Because celery root adds bulk and texture in a different way than kale does to the soup – it’s not a one to one comparison. That would be like saying replace sugar with garlic powder because it has less carbs. I have made this delicious soup many times and love it. Sometimes I add chili powder and red pepper flakes in place of the basil. I did want to make a note about cooking the chicken-I tried to ‘save time’ by just adding the raw cubes to the boiling broth-didn’t turn out flavorful at all. Pre-sauté the chicken makes it so much more flavorful. Lesson learned. Can I substitute cooked turkey for the Chicken? There is very little difference between the two so I would do it. Made this fantastic soup this morning!!! I didn’t have any fresh basil, so I threw some dried in at the end, otherwise, made exactly as stated!! Husband loved it too and wanted more. I made a single batch to make sure we liked it before we go for the 5 days and we loved it enough that I will make it again at the end of the weekend! Fantastic soup, with or without needing to do the 5 day stall break!! Thank you for all you do in the Keto world!! Just wanted to reiterate how much we enjoy this soup!! I made the initial batch on Friday without the intentions doing the 5 day drop. After enjoying it thoroughly, we decided to go ahead go for it and I made enough tuna salad and egg salad for the week and another double batch of soup this evening. Decided to go the route of the egg salad for breakfast and tuna for afternoon snack. I’ve made this soup multiple times….. its easy to make, looks great, and tastes fantastic. I especially love that once its done I’m pretty much done with my cooking for the next few days. Takes the thinking away from the ‘what next’ part of keto which happens to me often. One request, if you ever edit/ update the recipe…..could you please put the ingredient quantities in gm/oz in addition to cups ( e.g. beans- 100 gm)? It makes it much easier to just weigh out stuff and not think about cups/ sizes of veggies. Many thanks for an awesome recipe. This is a delicious recipe! I’m doing a Keto diet and was looking for a soup I could have in place of a salad. Fantastic flavour with easy to follow directions and suggestions for substitutions! I love the extra flavour the red wine vinegar adds. Thank you so much for your work on this. It’s going to be a stable for me from now on. I have made this soup 3 times now. I came across it initially because my mom is on a low-carb diet, and I wanted to make something different and “comfort food-y” that she could enjoy…But I like it so much I am making it again and again for myself! The entire family loves this – from grandparents to teenagers. We use the Jicama substitution and I would not even try celery root bc I love it too much. On one trip the store was out of chard so we used collards – not nearly as tasty. THANK YOU! oh no! my store was out of chard as well, so I bought collards. I am now tabling the soup for a day as I am about to try this for the first time. I am planning to begin the 5-day after my daughter’s wedding shower this Saturday because I know I am planning to be bad and need a reset! :) I want the soup ready to roll on Sunday!! I was just wondering what to eat for breakfast when doing this? 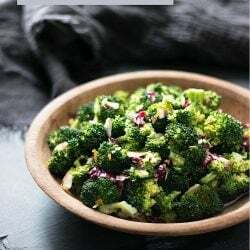 Check out the Keto Soup Diet Meal Plan – it’s all in there! This has now been added to my soup rotation – forever. We love it! I followed pretty closely, but added some zero carb spicy sausage we had in the fridge to bump the protein and flavor. SIDE NOTE: Celery root is now one of my favorite things. I’m a celery lover already, so it’s a no brainer. I used it in a low-carb recipe for Clam Chowder and having that texture in the soup made all the difference. Thank you for another ‘keeper’. Love this soup plan-but I think I made a mistake and I still lost weight! 7.5 lbs to be exact. I measured two cups of soup which gave me 10 portions-just right over 5 days (I added an additional 3 cups of stock to make it all work). I now see it is 1 1/2 cups but I think I’ll stick to this plan as I was so full I didn’t eat my snack :) thanks again for creating the IBIH and the Soup Plan and the Egg Fast-I have lost 30lbs over 3 years but more because of portion control than anything else (and I cut out cheese and nuts this month to see if that would make a difference). Have a great new year. I made this thinking I wasn’t going to like it, but I at least wanted to give it a try. OMG — I love it! And even better, my husband likes it even though it’s full of veggies he’d never touch. The broth has such an amazing flavor. I’ve never eaten celery root, and I really like it! I did sub chicken thighs for the the white meat chicken. Thanks for this recipe! hi! let me start by saying that I love your recipes! I intend to start this detox immed after the holiday season but we dont get yellow squash here. Can i sub with zucchini? or any other suggestion? Did you ever find a suitable substitute for yellow squash? Went all over looking for it… none here where I live! Yellow squash is often labeled zucchini squash at my grocery stores so I think you might be ok subbing zucchini. I live in Greece; we don’t have yellow squash here, either, so I’m just going to go with zucchini. I suspect the yellow squash was primarily there to provide bulk and colour, in which case zucchini would be an acceptable, if less interesting, substitute. Mellisa, this soup has been pinned to one of my boards since I saw it on Facebook a while back. I finally made it today and although I haven’t added the red wine vinegar or basil yet, I had to have a soup ladle full. It is SO delicious. I made it using all the listed ingredients, but in the future may try a few subs. This will now be a “go to” for me. Thank you!! So glad you liked it Adria!!! I have now made this soup 6 times….love love love it! The ease of knowing what I will be eating has really helped me on my low carb journey. You may want to mention rutabaga as a sub for the celery root….It is cheaper per pound than celery root and easily available for folks who can’t find celery root. I have also been subbing out the bacon and using finely diced boiled ham and adding some bacon fat…..for those days I don’t have bacon. Thanks for sharing your subs Janet, so glad you’re enjoying the soup!!! Made this soup last night, very good. Thanks so much for sharing. Getting all the ingredients today and making the soup …..starting the plan tommorrow…. I’ve been struggling with losing weight….so am excited to kick start the loss. Will let you know how I do. I talk about that in the post Tammy – it is much higher in carbs. Im dying to try this soup!! Unfortunately, I am allergic to green beans and squash, what would you recommend I substitute for both? I was thinking cauliflower would probably work. Or should I just omit both? I have to say, I LOOOOVE this soup!! I leave out the basil at the end (not a fan), but otherwise I made it by the recipe exactly…and it is wonderful! My question is this…could a lean ground beef or lean stew beef be sustituted for the chicken to make a variation? Thank you so much for sharing this recipe!! I lost 9.2 lbs in a week, eating the soup once a day and two low-carb meals, with low carb snacks in between! I am never hungry but am losing weight!! How fantastic!! Do you have a suggestion for what to use instead of mushrooms? I am excited to make this soup this morning. I need to detox from the bad eating ugh. I couldn’t find celery root so just using celery. Do i use the stems of the swiss chard as well?? Thanks.. i will post to let you know my results. Thanks for all your hard work with all your amazing recipes. Yes use the stems! Hopefully the celery flavor won’t be overpowering, next time I’d try turnips or cauliflower as an alternative! This soup is so delicious. My 5 year old had 3 bowls of it. The flavor of the broth is really unique. I would make this even if I wasn’t eating low carb. 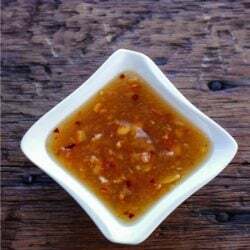 Can you sub beef broth in the recipe or would it make the flavor weird? I made this soup today, and had my first bowl for lunch. It is AMAZING!! The only thing I found I had a problem with, was getting a full 5 days at one and a half cups per Bowl.I got 31/2 days. I followed the instructions to a T. But it is something I WILL be making again! Do you have any idea why I didn’t get a full 5 days supply!? I made it and I got five days. After I was done with the soup I immediately put into plastic container and I measured each one out and it worked for me. Uh oh. I’m making this right now and I’m not sure if I was supposed to include the Swiss chard stalks. Made this recipe exactly as stated (just missing the basil to top is off, which is a bummer) and it was AMAZING! So GOOD!!! Never had celery root before, and I think it is what makes the soup. So much flavor, so fresh, filling, I wish I could eat more than two cups at a serving because it tastes sooooo good. Thank you so much for this recipe. I am actually looking forward to eating this over the next five days! Will make again. Crazy question…. but do you have a recipe for the Chicken Stock? Can we just use Chicken Broth? Store bought broth or stock is fine – or you could use my Instant Pot Bone Broth recipe in a pot on the stove or even a slow cooker. Be careful when buying stock, though. Some of them have more carbs than others. I have just made this and it looks and tastes lovely! However, I did use butternut squash, which I am regretting now as doing a bit of googling I see that yellow squash is not the same thing :( Being from the UK we do not really have yellow squash, so I assumed it was butternut. I hope this won’t impact the results too much! But I am looking forward to trying my first full bowl and starting the 5 day soup diet tomorrow (I have my last bottle of wine to finish today)!! Thanks for a great receipe and blog ! I used Long Squash and Zuchini, the long squash is low in carbs and has a good amount of potassium! Love the taste, at the end of 5 days I will post me results. Hi- I saw a one week diet plan with this recipe link and forgot to save the diet plan, only saved the link…I think it was egg salad wrap or tuna wrap twice a day plus the soup 3 times a day? Does anyone have that info or page link they could post or send to me? I added the link at the top Angela – and here it is as well! This website was shared with me by my aunt, who has been following it for about a month. I just made this recipe substituting the swiss chard for collard greens and the bacon for turkey bacon (I don’t eat pork). It was delicious! I am not much of a cook but this recipe was extremely easy to follow. I was a little skeptical about liking it because I do not like tomatoes or mushrooms but I cooked with them to try to follow the recipe as much as possible. However, I was very shocked that I liked the mushrooms and tomatoes in this soup. This was one of the best tasting soups I have ever had (including homemade soups and canned/store bought). Thank you very much for this recipe! I will be making it again, as I plan on starting the 5 day diet soon! I cannot wait to try the other recipes on this site. Thanks so much Jo, glad you enjoyed it and I appreciate you taking the time to let me know!! I have been doing low carb since March 2 and as of this morning have lost 29 lbs. My goal is 30 more pounds. I admit I have not been Uber strict, but have been cognizant of the carbs. Thinking of giving the soup a try but I am going to start with half a recipe to see if I like the flavor because I hate mushrooms and despise cooked greens. That said, I am willing to give everyone it a try. I was thinking of chopping the mushrooms and chard into small pieces in case it is partly a texture thing. This is incredible!! So much flavour! Everyone in the office came to see what I was eating, purely on the basis of how incredible it smells, let alone tastes!! What is the closest sub for celery root? No store near me sticks celery root. I’m considering rutabaga, parsnip, or turnip and have never tasted or cooked with any of them. Thanks! Turnips are a good sub, and have thee lowest carbs of the three choices. I’m using ruttabaga and parsnip. My store didn’t carry celery root either. Hi Mellissa. Just thought I’d let you know that this soup is delicious! Thank you. I also want to thank those that have posted their subs with equivalent carb count. That helps a whole lot when ingredients are hard to come by or don’t have on hand but want to make this soup, like, right away. I didn’t have any bacon (yes, forgot to get some) BUT I did have bacon grease and I used some of that instead when reheating my 2 cup portions, no tomatoes, no celeriac but subbed with jicama and celery. Yummy. This soup is so good and tasty even with my omissions that I don’t see how it can get any better with the whole complement of goodies in the recipe. I will test that though . In 3 days I’ve lost 6.4 lbs! Day 1, I had 2 meals of 2 cups each. Between meals I had a snack of a cheese wedge (Laughing Cow, but Aldi brand, much cheaper same taste) on a romaine leaf. I was hungry before going to bed after the soup dinner, but I didn’t cave. Day 2, again 2 meals of the soup but I switched to breakfast for dinner with 3 eggs and 3 sausage links to stave off hunger later and it worked. Day 3, 2 soup meals, and hunger was a looooong way off. No snacks. Dinner was bacon on romaine leaves. When I portioned the soup into 2 cup containers so I wouldn’t have to measure again, there wasn’t enough liquid in any of them. No problem. Once in the reheat pot, I added 2 cups of water with a ½ tsp of powdered chicken bouillon for additional flavor (just in case), more of the spices and ½ tsp of bacon grease (remember I had no bacon) and about ½ tsp ACV. Wow. Only a slight loss in flavor. Day 1 and Day 2 I didn’t find the soup very filling. On day 3 (when I began to add more liquid to the reheat pot, and ½ tsp bacon grease) it was extremely filling. Margaret I am ecstatic for you! 6.4lbs lost in just three days is truly fantastic progress, and it sounds like you didn’t go hungry much either! I really appreciate you taking the time to update us – this is definitely inspirational! It says ” substitute apple cider vinegar if you want ” …what would I be substituting it for? I don’t eat any pork products ( I know, I know “how do you live without bacon?”) Any way, do you suggest a substitute for the bacon or just omit it entirely? I can’t wait to make this! i am so glad I found your site. I don’t follow a low carb plan, but wanted something to jump start my weightloss after a binge-full spring! 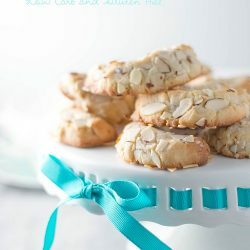 I found this site and recipe scanning Pinterest and it’s exactly what I was looking for. I couldn’t bring myself to spend $5 on celery root that looked like a moldy tree stump, so I used celery thinking it’s basically the same! Oh well, at least it didn’t hurt. Love the fullness I felt after eating the 1 1/2 cups for dinner. I did add 1/4 avocado and some hot sauce which I thought gave it the touch of creaminess and zing it needed. After all the chopping and prep the amount of soup it makes is totally worth it. YUM. Hello! I saw a couple of people ask this question but didn’t see a response, but then again I could be blind =). Can you please tell me if any of you have made this soup in the slow cooker, and how it turned out? I used the slow cooker and it was spot on. I didn’t have time not to use it (working, two kids (three inc husband), house, pets etc). Lazy in some respects but results where amazing. I made the soup, it’s very good. I couldn’t not find celery root, so I substituted with jicama. It was my first time cooking with jicama, but it turned out great! I brought a 1L jar of the soup to work this morning, and dropped it on the floor :-( The jar smashed into pieces! I was planning on doing the soup diet for the week, so I’ll have to make another batch. I know you get a lot of questions. Please forgive another. I made this soup for the first time ever. It tastes amazing!! I think I made some mistakes though because instead of having 2 cup servings for each lunch and dinner it was more like 1 cup. I made sure I used all the liquid required. I think I may have not used as many vegetables as Im supposed to. For instance your shopping list said to buy 8oz mushrooms but the recipe said 1 cup chopped mushrooms. When I measured it out 8 oz was more than one cup so I didnt use them all. Do you think this is what I did wrong? Any tips on measuring chopped vegetables properly? Seeking advice from the expert! :) Thanks in advance. You can add more broth if you are having trouble getting the full amount – it’s possible that you had a lot of evaporation? Can you recommend a proper alternative to pork-bacon for people who keep a strict kosher diet, please? TIA! I really enjoy your content. People are posting progress on the forums – someone just reported that they lost 8.1 pounds in the five days! I’ve lost 6.4 lbs in 3 days. Began Wed. and Sat. morning weigh-in was a 6.4 lb weight loss. Thank you for this recipe! To use what I had on hand, i subbed zucchini for yellow squash, radishes for celery root, 2 tbsp tomato paste for sundried, and collards for Swiss chard. It’s totally possible to make it work for “you”. I just made sure anything I subbed wasn’t more carbs than the original. It was a good soup, but the surprise for me was the apple cider vinegar! Took it to a whole other level and definitely made it! Delish! I don’t think I’ve ever come across celery root in my local stores. What is a substitute that will be similar in taste/carbs? I used jicama, and it tastes fine. I compared nutrition information, and the carbs are very similar for celery root and jicama. The celery root at my local Harris Teeter were covered in mold, so I opted for red potatoes instead… Would it still taste okay? Also, is the mold on the celery root harmful? I’ve never tried it before, so I was hesitant to buy it. Red potatoes are very high carb and will ruin your results on this plan I’m sorry to say. Oh, sorry I forgot to mention. I’m sharing this soup with my family, who are not partaking in my diet. So no worries, I won’t be having any potatoes!! However, is mold on celery root still good to purchase? You’re going to peel it anyway so a little is probably not horrible but who knows what is under the skin if it’s already moldy on the outside so probably a good call to pass on it! 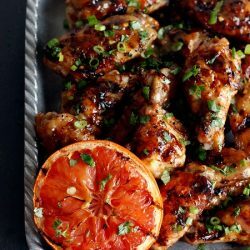 I know making certain substitutions might be frowned upon, however I’m curious about using skinless chicken thighs instead of breasts? I couldn’t bring myself to spending $21 for one organic humanely raised chicken breast, the thighs were much more reasonable. I know it will be higher fat content. Thoughts? This was the best soup!!! Everyone in the house loved it!!! Made the soup to your specifications and it’s DELICIOUS! I’ve never used chard in a recipe before. Not even sure I’ve eaten it before, but it’s delicious. I bought all your cookbooks last night (the $19.99 deal) and love them. Can’t wait to make more recipes. Some of my faves of yours are the Easy Green Chicken Enchilada Soup. So good! And then your lemon pie. Oh! And your Cheesy Spinach Stuffed Chicken Breasts. Have made those numerous times. And so tasty left over as well. Thanks so much for doing the heavy lifting when it comes to Keto. I’ve been eating Keto for a year on June 26th, and I’m down 25+ pounds and feel so good! Plus my husband is diabetic so it’s also great for him. Appreciate you. This soup is DELICIOUS! I had some zucchini to use, so I substituted zucchini for the yellow squash–almost the same. Then I saw somewhere in here that I could use collard greens instead of swiss chard, and I had a lot of kale which is a lot like collard greens, so…. I measured 4 cups of chopped kale–packed down, so there was a lot of kale. I am only guessing that the carb and calorie count on my soup is close to your recipe. I hope so. I could eat it all day! Oh, yeah. I almost forgot. Instead of chopping basil at serving time, I took one of my “basil cubes” from the freezer and dropped it into the soup pot at the end. I make my basil cubes when basil is in season. I take a bunch of basil leaves and finely chop them up in my food processor with some olive oil. Then I put the green mush into ice cube trays to freeze for my soups. You didn’t say whether the tomatoes are packed in oil or not. Mine are, but I drained them before I chopped them into the soup. A wonderful recipe. The celery root is perfect in there. It made me think I was eating diced potatoes in my soup. So glad you liked the soup! A note on kale – it’s not interchangeable carbwise with chard or collards as both of those contain 3g net carbs in 4 cups. Kale contains 21g carbs in four cups, and if you packed them tightly it’s probably more. So your soup definitely had more carbs than stated – next time to keep the carbs under control be sure to use chard or collards if you can get them – or at least cut your kale amount in half. Yellow squash is also called Summer Squash or Crook Neck Squash. Bright Yellow in color and shaped kind of like a question mark “?” If you can’t find it, you can use Zucchini or I think you call them Courgettes? Any tips on cooking this in an instant pot? I’m going to try this tonight, sounds SO good!! This soup sounds delish! I had been in a stall for more than a month, so I just changed to total carbs from net carbs. Can you tell me the total carb value? Even if I don’t eat this now, I’m definitely saving this for later! Thanks for sharing! Can you please tell me the name of the tomatoes you used? I don’t remember – they were dried though, not packed in oil. If this is what dishwater tastes like, then dishwater tastes WAY BETTER than I could’ve ever imagined! My sweet husband made this for us today, and we couldn’t be happier with it! Thank you for sharing this delicious recipe and introducing us to celery root! They’re such an awesome substitute for potatoes; you don’t feel like you’re missing out on anything. Have a great day and please keeep sharing your recipes! My wife and I followed the recipe exactly. This tasted like swamp water.. We definitely will NOT be making this again. What a waste of time and money for all the ingredients. We threw the entire batch in the garbage disposal. I’m sorry you weren’t a fan, but since so many have made this recipe with excellent results, I have to wonder if something went wrong on your end or with one of your ingredients? Love this soup! It has a simply amazing smoky bacon flavor! Made the soup it taste great . But is the bacon supposed to be wilted and whole? Or chopped and crispy? I cooked it in the oo for about4 mins and it didn’t get criapy or curly so I continued with the instructions. Its long and wilted. Is that normal? Hi Carol! The recipe calls for 4 strips bacon, chopped. You chop it first and then when you cook it the fat and flavor renders out into the soup. It won’t be crisp but the small pieces mostly disappear into the soup. It’s definitely not supposed to be whole strips of bacon. Oh man! I guess I goofed, do u think I can fix it somehow. I planned on eathing this all week since I just had my wisdom tooth out and I dont want to load on ice cream and pudding etc. I just made your soup, it is totally awesome. My stores didn’t have celery root or swiss chard, but they did have fresh parsnips and spinach so that’s what I used. I can’t have a lot of sodium so I used 8 packets of sodium free chicken broth with water. This is a keeper! Down 40 lbs from year ago today! Thank you so much for sharing! How much fiber is in each serving? They look delicious! Can’t wait to it! I was looking for a low carb soup option and stumbled upon this. Cheers!! I just made this and it’s delicious!! I was looking for a high protein soup to help me during the holidays . does this freeze well? i will be making a bigger batch to freeze. I followed the recipe exactly and i was surprised how delicious it came out.Thank you and i will be making more of your recipes. This soup was delicious. I am building my diet around it. I will definitely be making this soup, it looks delicious. This was fantastic! Cold, rainy day, and I was looking for a low carb soup option and stumbled upon this. Don’t believe that I ever had celery root like this before, what a perfect replacement for potato! Very flavorful and filling. I just made this soup and …oh…my…goodness!!! It is AWESOME!! My grocery store didn’t have Swiss chard so I substituted Bok choy and it came out amazing! Thanks for the recipe! You rock!! I’m excited to try this. Do you happen to know the total carbs per serving? I have been at a stall and starting to graze a bit too much. Have been looking for something to turbo charge me again and get me losing weight again. I want to lose another 30-40 pounds (I have already dropped 90 pounds with HPLC diet – not Atkins specific but very close). This soup looks like just the thing. Will be making it this weekend. Can I freeze some of this for a later date? By far one of the best soups I’ve ever made! My husband was doubtful that it’d be bland but was amazed at how good it really was (two bowls later). Even in this Hawaii heat this is my go to quick meal! Honestly, could be the most delicious soup I’ve eaten. Needed something satisfying and tasty….. Got that with bells on. Great recipe, thank you. This sounds wonderful but seeing as how it’s 99° today soup might not be perfect for dinner but I’m thinking of making it without the liquids and as a stir fry. I’ve got some garden fresh veggies to try in it….yummy….can’t wait!!! This was the BEST! Thanks for sharing! Hello – I am making this soup for the third time because my husband loves it (I do too, and I’m not a soup person at all). I use frozen green beans, they work fine, and I just toss them in frozen. I also use dried basil, not fresh, since I always seem to have waste with fresh. Today I forgot to cook the bacon first (I thought I had it memorized enough to cook it without opening the recipe) so I zapped the bacon in the microwave and chopped it up and tossed it in. It was fine. This is wonderfully versatile, you can use any greens, even spinach and you can leave things out or put other things in. It’s a very filling snack or lunch as well as a good side dish for dinner. As you say, it freezes up very nice and is even better reheated. Thanks for the recipe! Do you use the stalks in the Swiss chard? I did Laura, just chopped them up to 1/2 inch pieces! My husband is diabetic, on insulin. Has kidney problems also. I have been making this soup for 4 months, he loves it. His sugar readings have come down, but when he went to his kidney dr yesterday, he told him his kidneys show more protein from his last blood work. I’m wondering if it’s the soup. Is this soup to high in protein? Both diabetes and high blood pressure can cause damage to the kidneys, which leads to proteinuria. Other types of kidney disease unrelated to diabetes or high blood pressure can also cause protein to leak into the urine. BTW, Melissa, the soup is delicious. I subbed rutabaga for the celery root and it added a nice hearty, spiciness. I’ll be gobbling this up all week! Could you put all these ingredients into a crock pot then switch it on for 4 to 8 hours and leave it? I’m wondering this too. Did you try it? I just made this amazing soup for the second time. Thanks so much Mellissa! zucchini or patty pan squash are good subs for the yellow squash also — even spaghetti squash at the end (cooked and scraped out already) for a kinda noodle soup! i love grn beans as a noodle sub tho too. and for extra hearty soupp—beef it is! Quick question: I do more of a liquid nutrution meal plan. Would this work as a gazpacho type of purée then eaten with the chicken and bacon chunked in the purée. Hmm that sounds delicious maybe I will just whip up a batch and find out 1st hand. Yum! I’m thinking of replacing the celery root with radishes and the Swiss chard with collard greens, since I have those on hand now. 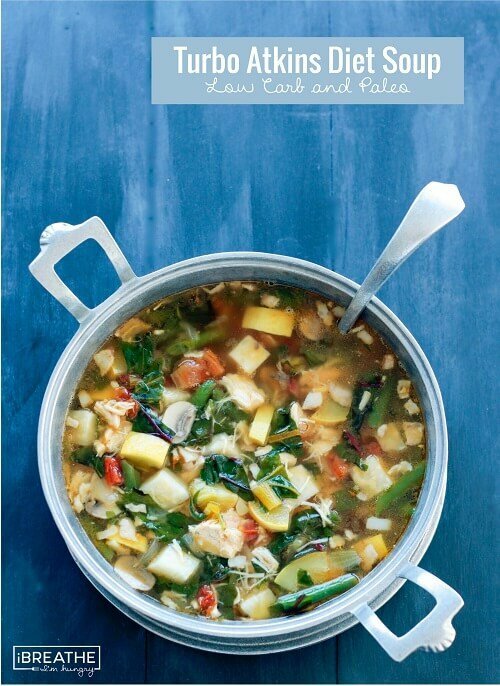 Can’t wait to try this…LOVE making a big pot of soup and eating on it throughout the week. And having something readily on hand is 80% of my battle with healthy eating. Thanks for this yumminess! Happy New Year! Thanks Amanda and I love both of your substitute ideas! Let me know how it works out with the radish especially! Enjoy! I’m happy to say that the substitutions worked beautifully! I had good reason to believe the radishes would work well since I’ve replaced potatoes with them before, and the collard greens are great as well. Which is good because I have a bunch of them that are still producing in my garden. It’s a winner and one that will definitely happen again! My 2 year old is enjoying her second bowl! Two thumbs up! a stupid question but what do you store it in? Depends – you can store it in the pot in the fridge if you have room, or break it into smaller portion sized containers if you have them and freeze some, or if your whole family is eating it store it in a large glass or plastic container. Whatever you usually store food in I guess. My kind of recipe that is fabulous and super simple to make. Thanks a bunch! Thanks so much Debbie – hope you like it! I appreciate that Norma – I think you’ll enjoy this one!!! I LOVE soups and love making soups. This is just what I need to re-kick in my keto/atkins diet. I started it last February, laxed quite a bit on the carbs and sugar over the holidays and am ready to get going again. With steady workouts, I lost 17 pounds and 6 inches last year! With an improved metabolism, I didn’t gain much back. Want to stock my freezer with soups for my lunches at work. Love your blog and your recipes! Thanks and congrats on keeping the weight off Denise – hope you like this soup!! This looks amazing!! I’m definitely making this tomorrow! Yay! Hope you like it as much as we did Ingrid! My fitness pal is notoriously inaccurate (I wish you knew how many times I have to type that sentence to people looking for reasons as to why my numbers are different) because it uses averages and sometimes brands with sugar are averaged in due to key words in their database or other reasons. I can assure you my numbers are accurate because I calculate each item individually using calorie king for the specific brand or item and then I tally them all up and recheck it several times to be sure I’m on point. I’m confident in my numbers – perhaps they aren’t subtracting fiber from that number either. You are correct and I most humbly apologize for even posting this but when I saw the number of carbs I panicked. Came to find out that any recipe I incorporate from the web into myfitnesspal, I must go through each ingredient and make sure I am using only verified ingredient nutritional info. For instance, where it matches onion(and why it doesn’t match it with a verified item to begin with I don’t know) but it comes up with something like 384g carbs alone. Once I went back through your recipe and matched up verified ingredients manually, it did come out to four carbs. Sorry I ever doubted you. Your soup will be a staple on my table for a long time. Thanks so much for responding though I’m sure you are tired of having to because of app shortcomings. 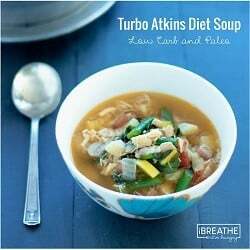 Thank you so much for this; IBIH TURBO ATKINS DIET SOUP – LOW CARB & PALEO. My 53 yo husband and I just came from our annual physical. My husband is 50 lbs overweight and pre diabetic. (he was an athlete his whole life so this was hard to hear) This will be rectified in spite of him kicking and screaming!! He had two bowls of your soup and announced satisfaction. My husband woke up this morning and announced how well he had slept…. Thank you again, I will continue to search the Internet for recipes authored by you.